Natural Shells Best Value Bedding Set. Inspired by toile de jouy in a fresh shell and starfish motif on an aqua background with intricate stitching for texture. Even the scalloped edges recall softly rolling waves. Revserses to a coordinated aqua/cream stripe. 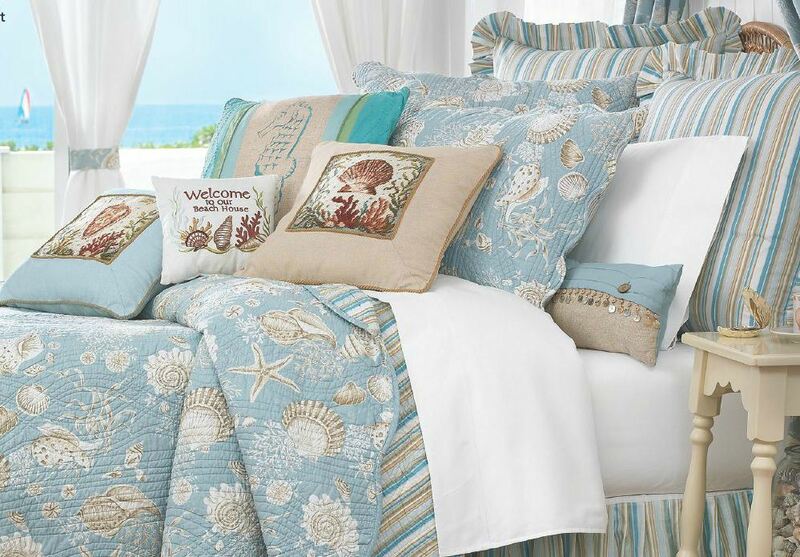 100% cotton with cotton fill, the Natural Shells quilt is Luxuriously Oversized. 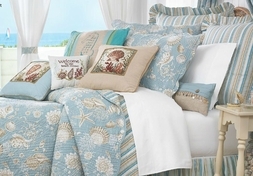 Set includes quilt, shams, euro shams, bedskirt and accent pillow (see below for sizing). Our Best Value! SAVE AN INSTANT 15% + FREE SHIPPING! Twin measures 66" x 86"
Full/Queen measures 90" x 92"
King measures 108" x 92"